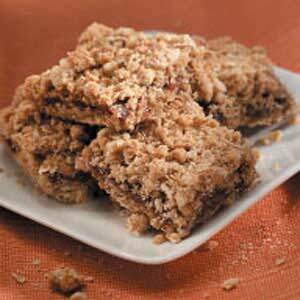 When I was growing up my Mom always made Date Bars, though they weren’t necessarily for Christmas, she’s make them throughout the year. Dates seem to be a winter fruit for us so I tend to make them in the winter. They’re one of my hubby’s favorite cookies. Enjoy our 12 Days of Cookie Recipe for Day 2! Mix all ingredients in saucepan. Cook over low heat, stirring frequently, about 10 minutes, or until thickened; cool. Preheat the oven to 400^. Grease a 9″x13″ baking pan and set aside. Cream together butter, shortening, and brown sugar. Mix in remaining ingredients. Press half the mixture into prepared pan. Spread with filling. Top with remaining crumble mixture, pressing lightly. Bake 25-30 minutes, or until light brown. While warm, cut into bars about 2″ x 1 1/2″. You can omit the date filling and substitute 1 cup of your favorite jam, raspberry or blackberry are great. See our 2009 12 Days of Cookies here. If I use old-fashioned oats will it make them chewier or just inedible!? Using old fashioned oats is fine, it just changes the texture slighty. You can crush them a little bit with a pastry blender or a couple of pulses in a food processor. The flavor should be the same, however.